This summer has gone so quickly for me. For you too? Some of my friend’s kids are already back in school, and even though we aren’t going to start til early September, I’m already thinking I need to get going on some planning. But before then, we’re going to try to fit just a bit more camping in. Just so you don’t think I’m a super-hero for camping with 6 kids, my version of camping these days includes a travel trailer with a bathroom and a microwave, so I’m pretty spoiled. But we did our share of tent camping when our kiddos were little enough to be crawling around in the dirt and trying to eat all the interesting tidbits they found on the ground. This evening I’ve been on Pinterest, looking for some fun new ideas for camping food, and I thought you might enjoying the ideas that caught my eye as most likely to be fun and affordable to do with my clan. I’ve seen this tacos-in-a-bag idea before, but we haven’t tried it yet. 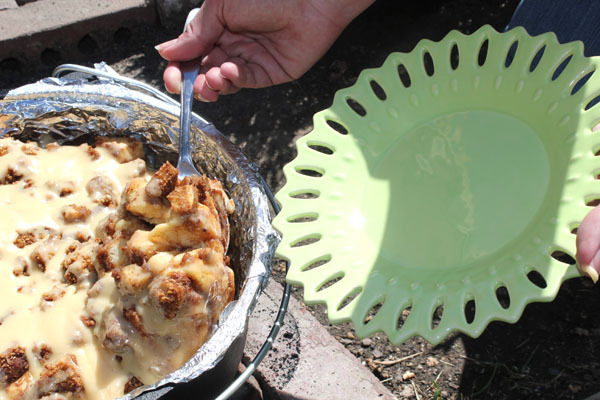 This caramel apple pie made in a dutch oven looks beyond fabulous. The mama who writes Echoes of Laughter has put together some great tips for making camp food easy. Her picnic sandwich looks amazing. I definitely want to try doing at least a meal or two in a foil packet over the fire. 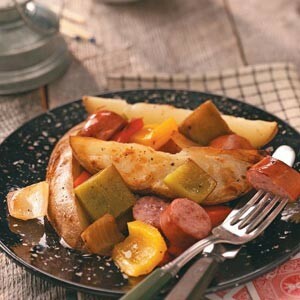 Here’s a potato sausage version that looks yummy for either breakfast or dinner. I’m leaning toward doing it at breakfast, because a fire at 6PM is sometimes a bit more heat than is welcome on a summer day, whereas there tends to be a bit of coolness still in the morning. My kids will love putting together their own concoctions. I think I’ll cook the potatoes and sausage ahead of time so that really they only need to heat it over the fire. If you need some help putting together a food list for a camping trip that you’re planning, check out this helpful article. I’m seriously thinking about springing for a few of these camp cookers . You butter bread, place a slice into the cooker, add a layer of whatever filling you want, then top with another slice of buttered bread, then cook it in the fire. 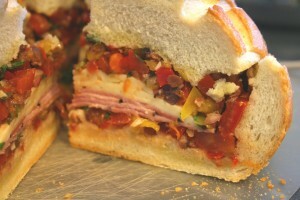 Maybe you’d like a grilled ham and swiss sandwich, or BBQ’d chicken with peppers, cheese, and onions, cream cheese and grape jelly, Nutella, or even apple pie filling. There are so many possibilities. And again, this type of cooking lets kids put together can eat what they want. Usually the rule around here is ‘you get what you get and don’t pitch a fit’, but why not make an exception when camping? If you camp with your family, I’d love to hear your favorite easy and affordable food ideas. As kids we called those little sandwich makers “pudgy pies” and our favorite fillings were cherry pie filling or pizza sauce, pepperoni, and mozzarella cheese. They were a camping staple and we could make them ourselves as long as there was a fire burning. When we are camping with the ATVs, we use the ‘hoagie makers’ to cook a whole bunch of pizza pies one evening while supper cooks and then they are lunch on the trail the next day. They are fabulous! You will enjoy owning and using those irons! We do the crescent rolls too but melt butter in a shallow pan and mix sugar and cinnamon in another pan ir large shallow bowl or plate …cook the crescent rolls on the stick (as evenly and thinly as possible) then roll in melted butter then roll in cinnamon /sugar mixture – good for breakfast or dessert. We use the pudgy pie makers for pizza’s and sweet treats like cherry pies. We also make grilled ham and cheese on a skillet, fish fry, Precooked sausages (like Chorizos), cold sandwiches, and we end our trip with a big breakfast over the fire the last morning Eggs, sausage, pancakes, hashbrowns. We tent camp so we only the fire to cook with. If doing tacos in a bag (or called walking tacos by us) be prepared that one will not fill anyone up! Also good with any kind of chips. We had a little tiny trailer as well as some tents that we camped in when I was growing up. As a parent myself, I took the kid (and assorted friends) tent camping because that was all I had. Generally good times, although some summers were insanely hot, and one spring break trip brought a cold snap that left us shivering in 30 degrees! We did fire cooking for the majority of it. I did the foil packet things several times, with a couple of meats and sometimes fish with sliced squash/zucchini/onion type things. I did wrap and pack those at home, then just had them iced in the cooler until time to cook. They were fun meals. I remember the camp cookers from my childhood with the grandparents. I can’t tell you what we cooked in them, I don’t recall that at all, but I recognized the cooker immediately. I know I thought about getting some for us, but I never did and then the camping thing sort of faded out as other things stole the time. Speaking of fun things to do while camping, have you ever just tossed a marshmallow into the fire? No stick, not cooking it to eat, it is a completely wasteful thing to do, but it is really fun to watch. We discovered that by accident one time, and then did it deliberately several times after that. we love reeses peanut butter cups and chocolate chip cookies for smores along with the marshmallow.